Youngest of three brothers born to Domenico Scrosoppi, a jeweler, and Antonia Lazzarini; his brother Carlo was ordained when Luigi was six, and his brother Giovanni several years later. When Luigi was 11 or 12 years old, his home region was struck by drought, famine, typhus, and smallpox in quick succession; the sight of such misery, complete poverty, and the number of orphans had a lasting effect on the boy. In his teens, Luigi felt a call to the priesthood, and he entered the same seminary as his brother Giovanni. Deacon in 1826; ordained on 31 March 1827 at the cathedral in Udine; he was assisted at his first Mass by his brothers. Director of the Pious Union of the Heart of Jesus Christ. Helped manage the children's center run by his brother Carlo. Franciscan tertiary. Assistant director of Carlo's orphanage in 1829. The orphanage fell on harder times than usual; Luigi, in desperation, hit the streets to beg for their support, and the school soon had a great lesson in faith - and enough money to buy their building. As there were more orphans than space, the brothers decided to enlarge the house; Luigi went through the countryside to beg building materials and labor. Work began in 1834 with Luigi coordinating, begging, supervising, and working construction; it was completed in 1836, and named the House for the Destitute. That year also saw another cholera epidemic, and the orphanages, again, were full. The need of the orphans, and the constant work of the brother priests, attracted the attention of several area women who were also working with the poor and the abandoned. Among them were Felicita Calligaris, Rosa Molinis, Caterina Bros, Cristina and Amalia Borghese and Orsola Baldasso. These women, under the spiritual direction of Carlo and Luigi, founded what would become the Congregation of Sisters of Providence who taught basic academic subjects and needle crafts. Luigi placed them under the patronage of Saint Cajetan, and the Congregation received final approval from Pope Blessed Pius IX on 22 September 1871. In 1846 Luigi joined the Oratory of Saint Philip Neri, a congregation devoted to charity and learning; elected provost of the community on 9 November 1856. On 4 October 1854 he finished work on the Rescue Home for abandoned girls. On 7 March 1857 he opened the school and home for deaf-mute girls; sadly, it survived only 15 years. He opened Providence House for his unemployed former students, and he worked in hospitals with the sickest and poorest of patients. In his later years, Luigi had to combat anti-clerical sentiments that swept through the Italian peninsula during the political unification of the country; many houses and groups, including the Oratory, were seized, closed, and their assets sold off. While he could not save the Oratory or parish property, Luigi did protect his charitable institutions, and saw the Congregation grow and spread. Born to a wealthy family, the eldest daughter of Tommaso Casini, an engineer, and Melania Rayner, she was baptized at the age of two days at the cathedral of Frascati, Italy. Her father died when Teresa was about ten years old, and she and her mother moved in with her maternal grandparents. In 1875 she began studying at the school at Santa Rufina in Rome, Italy, which was run by Society of the Sacred Heart nuns. Teresa early felt a call to religious life, and though she had a number of set-backs due to health problems, and faced some family opposition, she entered Poor Clare Sepolte Vive monastery in Rome on 2 February 1885, taking the name Sister Maria Serafina of the Heart of Jesus Pierced. Poor health caused her to leave the cloister on 2 December 1886. She returned to her family, and spent as much time as she could in prayer in the chapel of the Sacred Heart in the parish church of San Rocco in Frascati. The church and chapel were badly neglected, and Sister Maria worked to restore them. All the while, she kept hearing in inner voice calling her to console the sufferings of the Heart of Jesus, particularly those caused by faithless or undisciplined priests. With this as her goal, and on the advice of her spiritual director, she became part of the community called True Lovers of the Heart of Jesus. When the group's leader died, Sister Maria gathered everal like-minded sisters, and using her inheritance, on 2 February 1894 she founded the Victims of the Sacred Heart as a cloistered community. They received diocesan approval on 1 April 1896. With the encouragment of their bishop, Cardinal Francesco Satolli, in the early 20th century the Victims moved from being a clositered order to an active one, working to help priests in their parishes. They founded a school for girls in 1910. On 1 November 1916 changed its name to the Oblate Sisters of the Sacred Heart of Jesus to better reflect their status and mission. In 1925 she starting working with the Little Friends of Jesus, which educated boys, helped support vocations, and later expanded to assist priests with health problems. Late in 1925 Mother Maria's health collapsed completely, and she was eventually paralyzed for the final decade of her life. She never stopped working, running the Sisters from bed, meeting, teaching and consoling sisters, priests and seminarians until the end. The Oblate Sisters continue their good work today, assisting and supporting priests and vocations in Italy, the United States, Brazil, Peru and Guinea-Bissau. Second son of Richard and Alice de Wych. His father died when the boy was young. The family fell upon hard times, but as soon as he became old enough, Richard took over management of their estates and brought them back to profit. Educated at Oxford, England, in Paris, France, and in Bologna, Italy. Chancellor of Oxford University. Legal advisor to Saint Edmund Rich and Saint Boniface of Savoy, the Archbishops of Canterbury. Priest. Bishop of Chichester. Miracles and cures occured at his shrine in Chichester. His patronage of coachmen began with the Milanese Guild of Coachmen, possibly because Richard drove carts and wagons on the family farm. Born to the nobility, a member of the wealthy and powerful Sacchi family. 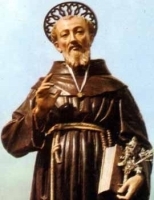 He joined the Franciscans while Saint Francis was still alive, and made his final vows c.1224. Priest. Father Gandulphus spent his life praying and preaching throughout Sicily. Founded the Franciscan convent at Termini Imerese, Italy in 1256. He cured a young mute man outside Polizzi Generosa, Italy in 1260 which led to his preaching having great affect on the local people. Member of the Trinitarians, beginning his novitiate at the Shrine of Bien Aparecida in Cantabria, Spain, and making his simple vows on 11 October 1914. He studied at several convents, and made his final profession on 17 May 1918 in Cordoba, Spain. Ordained a priest in Madrid, Spain on 23 October 1921, he began to serve at the church of Sant’Ignazio de Loyola dei vaschi. A musician familiar with several instruments, Father Juan was an excellent cello player. On 13 March 1936, the church was burned by anti–Christian forces in the Spanish Civil War. The Trinitarians left their convent, sought shelter with locals, and Father Juan was assigned to the Sanctuary of the Virgin of Cabeza. On 28 July 1936 the Trinitarians were expelled from the Sanctuary by Communist forces, and Juan found shelter with the Duke de la Quinteria in Andújar, Spain. In the spring of 1937, the Communists imprisoned him, tried him for the crime of being a priest, sentenced him to 20 years in prison, but decided instead to execute him for the offense of his vocation. Martyr. Born to the nobility, related to Duke Hessi of Ostfalen. Noted by the nobles for her exceptional skill at managing the estates and houses of her family, and by the poor for her almsgiving and care for the sick and dying as she travelled from estate to estate. She spent her days managing the estates and caring for the needy, and her nights in prayer. In her later years, she retired to the convent at Wendhausen, Germany and with the approval of Bishop Thiatgrim von Halberstadt, eventually was locked into a cell next to the church of the cloister, and lived the rest of her life as an anchoress, praying, doing penance, and giving wisdom and spiritual training to any who visited her, rich and poor, lay, ordained and consecrated. Reported to have had the gift of prophesy. A monk of her aquaintance was so impressed by her piety that he wrote a biography of her soon after her death. Born to a poor and pious family. Ordained a priest in the diocese of Jaén, Spain on 22 December 1900. Served six years in the parish of Santiago Apóstol in Valdepeñas de Jaén, Spain while earning a degree in theology. Known in all his postings as "a learned, zealous and pious pastor". Archpriest of Mancha Real, Spain in 1914. Founded a Catholic Union. Established men's and women's branches of Catholic Action. Imprisoned with other priests and parishioners at the outbreak of the anti–Christian persecutions of the Spanish Civil War, Father Francesco ministered as best he was allowed to the physical and spiritual needs of his fellow prisoners. Sentenced to death for the crime of being a priest, he was the last of his group of prisoners to be murdered as none of the men wanted to shoot him; he took advantage of this to hear confessions and give absolution to the other prisoners. Martyr. Layman convert to Christianity in the apostolic vicariate of Korea. Zealous about his new found faith, he learned the catechism, then returned to his home village to try to convert his family and neighbors. When the anti–Christian Sinhae persecutions began in 1791, he protested the arrest of other Christians, and visited them in prison; for this, he was imprisoned for several weeks. When the anti–Christian Jeongsa persecutions began in 1797, Lawrence was ordered arrested; he went into hiding, but when the persecutors arrested his father in his place, Lawrence surrendered. He was imprisoned for two years and repeatedly tortured; records indicate that, along with other forms of torture, he received over 400 beatings. When the authorities questioned him, he would simply explain points of Catholic doctrine no matter what they had asked him. They finally gave up trying to break him, and simply killed him instead. Martyr. Little known about his life before he was chosen seventh pope in 116. He concerned himself with the liturgy, and instituted elements still in use today. He decreed that only priests may touch the sacred vessels, that bishops returning from the Apostolic See to their dioceses must present Apostolic letters, and that the priest shall recite the Sanctus with the people during the Mass. Reigned during the persecutions of the Roman emperor Trajan. Martyr. Born to Christian parents. He fled Sicily in 830 due to Arab invasion, and became a monk in Thessalonica. He joined the monastery of the Studium in Constantinople, but was forced to flee Constantinople in 841 due to iconoclast persecution. On his way to Rome, Italy he was captured by pirates and spent several years as a slave in Crete. He ministered to his fellow slaves, converting many. He finally managed to escape and return to Constantinople where he founded a monastery. When he opposed the Iconoclast emperor Theophilus, Joseph was exiled to the Chersonese. Bishop of Salonica. One of the great liturgical poets and hymnists of the Byzantine Church, credited with approximately 1,000 works. Priest in the Archdiocese of Kraków, Poland. Vicar of the parish of Zakopane, he was known for his service to the people, especially the poor. During World War II he helped escapees hiding from the Nazis. Arrested in May 1941 and sentenced to the extermination camp in Oswiecim (Auschwitz). Martyr. Born a member of an imperial Roman senatorial family, Urbicius was drawn to the Church and lived a pious married life. His reputation for learning and piety led to him being chosen the second bishop of the diocese of Clermont in the Auvergne region of modern France in 288; his wife entered a convent and he went to his diocese. However, his wife was unsatisfied with her new life, left the convent, returned to Urbicius and said she did not wish to give up married life. Seeing her, Urbicius realized how much he had missed her, and let her move in with him; they told people she was his sister who was there to keep house for him. The bishop‘s conscience soon got the best of him, and he left both wife and diocese to live in penance in a nearby monastery. Joined the Franciscan in Recanati, Italy c.1213. Priest. Founded several Franciscan houses in Provence, France during a 25 year apostolate there. Returned to Italy in 1242, and lived the bulk of his remaining 30 in cloistered retirement. Experienced many highs and lows in his spiritual life, with lengthy periods of aridity and doubt, but periods of ecstacies, visions, and mystic union. Had the gift of prophecy. Married layman and father in the archdiocese of Guadalajara, he worked as a mechanic. 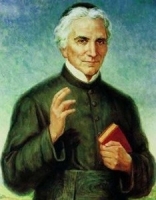 Brother of Blessed José Luciano Ezequiel Huerta-Gutiérrez. Noted for his devotion to the Eucharist and attendance at daily Mass. Imprisoned, tortured and executed in the persecutions of the Mexican Revolution. Martyr. Monk and abbot of Medicion Abbey in Bithynia (in modern Turkey). He and his brother monks suffered in the persecutions of iconclast Emperor Leo, and he was imprisoned for many years. Benedictine monk. Abbot of Saints Peter and Paul abbey at Wessobrunn in Bavaria (in modern Germany). Martyred along with six of his brother monks by invading Hungarians. Jesuit priest in the apostolic vicariate of England. Martyred in the persecutions of Queen Elizabeth I. Joined in the Poor Clares at age 15. Founded a Poor Clare convent in Foligno, Italy in 1423, served as its first abbess. Known for her reforms that emphasized Franciscan spirituality, she has the support of Pope Martin V.
Martyred in the persecutions of Diocletian and Maximian Galerius. Fifth-century bishop of Naples, Italy. 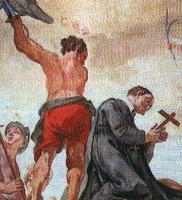 Translated the body of Saint Januarius to Naples. Monk. Hermit on a mountain near Pyrgos, Elis, Greece where his reputation for holiness, and as a miracle worker, caused many other monks to seek him out as a spiritual teacher. Convicted of possessing the Scriptures despite a prohibition issued in 303 by Emperor Diocletian. He was ordered to sacrifice to pagan gods; he refused. Martyr. Widow. During the persecutions of Diocletian and governor Dulcetius, Eutychia was exposed as a Christian when she refused to eat meat that had been sacrificed to idols. Martyr. Convicted of possessing the Scriptures despite a prohibition issued in 303 by Emperor Diocletian. She was ordered to sacrifice to pagan gods; she refused. Martyr. Mentioned in early Irish martyrologies, but no details about him have survived. Benedictine monk and then abbot of a monastery in Taormina, Sicily. Son of Domangen. Listed in the 9th century Irish martyrologies, but no other information has survived. Nine Christians who were martyred together. We know nothing else about them but the names – Arestus, Benignus, Chrestus, Evagrius, Papo, Patricius, Rufus, Sinnidia and Zosimus.